Shane made room for the man as Nate helped him with his bag and belongings. From the minute we saw him we knew this was no ordinary drifter hitchhiking his way across the country. The man introduced himself as Sergeant Major David Joiner, a 70 year old Vietnam veteran. As the sage-covered deserts disappeared in our review mirror and we entered the wooded river valleys of northwest Wyoming, David gradually let us into his world and all of the struggles, accomplishments, and honors that come with that privilege. David was a truck driver by trade and had explored our great country over the course of 45 years. When Shane asked what his favorite city was, Daniel respectively answered, “I don’t have a favorite city. I don’t care for them much. Now if you ask what my favorite town is I may have an answer for you.” It was Cody, WY, by the way. While filling up his rig in Rapid City, David had a heart attack. He was quickly released from the hospital, but was restricted from driving his truck until further examinations were done. David called his employer, but they literally left him out in the rain. With no other options David started pounding pavement, hoping to make his way back home to Salmon, ID. David explained that he had 11 children, all of whom graduated from college, 30+ grandchildren, and a handful of great-grandchildren. We later learned that almost 20 years ago to the date David’s wife, Christy Marie, and one of his young children died in a car accident when struck by a drunk driver. The man had experienced a full life filled with many challenges, lessons learned, and loss, but during all of this he never once complained. He didn’t complain about his employer. He didn’t complain about losing the love of his life. He didn’t complain about being spit on and constantly insulted when returning from duty in Vietnam. A short two hours after picking David up, we were in Hoback Junction at a gas station about to part ways. Shane asked David if there was a bus that ran to Salmon from here and David responded, “Yeah, well there is one from Alpine that runs to Salmon.” Shane glanced at Nate and then looked at David saying, “David, this is no ordinary road trip that Nate and I are on.” Shane went on explain what Project Wildness was and that we were going to get him home. 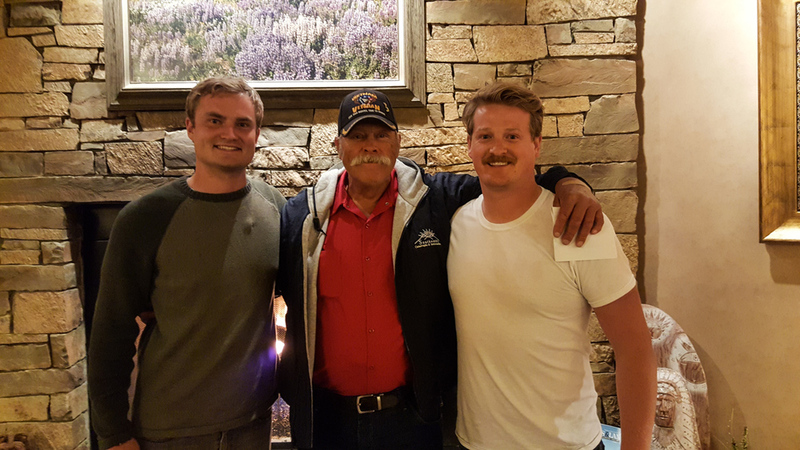 We drove to Alpine, WY, and got David a hotel for the night and enough money to catch a bus home while getting a few good meals along the way. David couldn’t believe it. He admitted he was tearing up and even explained that there is nothing wrong with a man crying. The theme of our entire conversation was RESPECT and David was vocal about never receiving respect like we had given him. We left David in a comfortable, dry hotel room in Alpine, WY. After shaking hands and exchanging hugs Sergeant Major David Joiner saluted us. It was an incredible honor to have and Shane quickly asked David how to properly salute so he could return the respect. David spent nearly 5 minutes showing us how to properly stand and salute. With a final salute we walked out the door knowing that a man who has given everything he has throughout his whole life without one complaint received the respect he deserves. To Elaine Everson… Your life has been a combination of travel and giving back; doing good deeds before they had a cool name like Project Wildness. I (Shane) experienced firsthand your willingness to help and serve others when you took me on as an economics student in an independent study. You have given so much to the community of Hawley and to the countless students and faculty who knew you at Hawley High School. Your generous donation brought a true American hero out of the rain and back home. To Melanie Somers… I (Shane) have had limited conversations with you over email which usually begin with me asking about some “vacation accruals”. Your donation brought tears to my eyes as you selflessly gave money to someone you hardly knew to do good around the country. You gave to relative strangers and we passed that on to a stranger of our own. I know you face many demands at work (some from me) and I have never heard you complain or be negative in any way. Thank you so much for all you do and keep being you!